I’m working with a client on a large-scale Digital Transformation programme at the moment. The organisation is taking time and real care to look at both the technology and integration of the technology to the organisation, with the intention to fundamentally shift/ modernise how the business operates. The part fuchsia blue is involved in is inquiring into and articulating the cultural/ people readiness part of receiving & working with the technology….. and then showing the fundamental operational shift being discussed …then working to map/ articulate how digital working might actually work for the organisation…including plans, experiences, staff development and so forth. As is so often the case with anything Cultural, it’s not straightforward to describe or codify. Organisational cultures are experienced, lived, created – they are based on stories and symbols, permissions and preferences. Whilst Project Plans & Operating Models are tidy and contained, typically drawn in neat lines and circles, with linear timelines and milestones, and held in diagrams and semi-permanent drawings, it is rarely possible to capture or represent culture in that way. Try it. Try to represent your Organisational Culture in a linear fashion. Operating Models are often complex, but they are rational and explainable – arguably why they can be drawn more neatly. Culture is deliciously, annoyingly fog-like. Ungraspable. Fuzzy. But undeniably THERE and can REALLY mess up a Programme Boards ability to see, to deliver, to move quickly. Culture eats strategy for breakfast? Maybe, but I see it as less aggressive and obvious than that. Well, if you are looking to actually transform any part of your culture (digital or otherwise)It’s pretty much essential to understand and work with where you are at now. If you don’t get the real picture of the density of the fog (including inconvenient truths about politics, leadership capability and willingness to give a damn about the future) you are opening yourself up to risks, unseen resistance and lost opportunities/ ideas. Successfully navigating digital transformation requires the ability to work both with clear structure AND the capacity to work with foggy wooliness/ ambiguity. Sometimes the former is favoured over the latter because the latter is, frankly, a pain in the arse to articulate. I get that…and it’s wise to get over it. Operating Model/ Visioning type conversations are an essential part of any process of digital / cultural transformation, however, they tend to be concept heavy, hypothetical, maybe even altruistic & don’t really relate to folks’ day to day experiences of the job they do. (To be clear, an operating model might relate to WHAT folk do, but rarely covers how or why they do it that way). “Visioning exercises” are great as a means to show where to & how we might get to a transformative point, but it’s folly (in my view) to believe these will somehow “transform” behaviour. Explaining future-states is not how we adapt. If anything it can freak folk out and encourage them to double-down on what they know. Explanation isn’t how we shift folk. Experience is. We need to bring Operating Models & Visions to life – let staff experience them, talk about them, create them, build stories around them. We have to give staff experiences of what they will use and a say in what they are unlikely to welcome (and they may need to be challenged on this, because often we will claim we don’t need/won’t use/ can’t imagine a thing which actually, given a wee nudge is exactly what’s useful). If you are seeking digital transformation, the success is boringly analogue. Bring your people in to be part of the design, and not in a tokenistic way… start booking rooms and getting facilitators trained at the procurement stage. Start thinking about how you will use audio, video, the physical spaces in your organisation, to encourage and support folk to interact with what is going on. How will you connect your people to the concept? We equally need to do some sort of opposite thing with Culture. Make it less internally experienced, more externally tangible and clear. In this particular piece of work, we are developing a number of areas where we can “benchmark” culture. I get that benchmarking culture is broadly an impossibility, but what we are trying to do is codify & articulate parts of the current behaviours / attitudes, the actions or skills that are more likely to help successfully shift people’s actions and willingness to work with the digital solutions they are being asked to take on. It gives us points of focus in the fog. It takes explanation and constantly asking folk who like clarity to have patience with fog. It’s worth it, if you can make the case to stick with it. How much time have you allocated to the people-part of the transformation and, knowing what we know about the time and effort it takes to create behavioural shift, is it enough? Julie Drybrough is a Organisational Consultant, facilitator, executive coach, blogger & dialogue guide. Working with people & orgs to improve conversations, relationships & learning – Doing stuff with love. As she steps from one space into another, I am struck by how beautiful she is. For a moment, I feel my throat catch and my breath shorten. She is stepping into her future self. It’s an oft-used coaching exercise – we hang out with the old, move into the here-and-now, step into the future. We move physically, as well as mentally, verbally, emotionally. At the start, she is hesitant – looking to me to reassure – is this right? Permissible? Am I saying the right thing? Thinking the right thing? Good Coachee? Others react differently. They jump in and complete the task. They are sure. Unthinking. Certain. They tell me decisively How The World Is… Oh. OK then. She is much more tentative, more hesitant. We all start from different places, I guess. But now? She’s up and running. It’s a hell of a thing to behold. She’s not some 6ft supermodel. She’s not high flyer have-it-all go getter. She’s not special. She’s not beautiful. She’s not quite right yet. (She defines herself as what she is not – and she is sure about what she isn’t. Very sure. Defendedly, properly, rudely sure. Me? I’m less sure. I’m deeply curious about the story she has set for herself – the excellent, binding narrative. The “I am/ I’m Not” story. It’s been written over years. Carefully constructed and edited…the one that has brought her here. As I watch her resolve to shift (maybe dissolve?) something, I am moved beyond measure. Eventually, after a long time of silence, of talking to herself and to the middle-distance, she looks at me. A little shy, a little embarrassed, a little defensive, perhaps – I’ve seen her unguarded. Then I realise I’m grinning and I might need to explain myself…. And we begin a different conversation. What’s emerging as I continue to ask myself and understand for myself What Matters to me in the work I do (see here and here for more) and how I do it is the importance of possibility. I like having choice ( even if it is only the illusion of choice) and I like it when I can see, or magic up, or work to create choice with clients. Where there are no options, the work feels deadened and empty, stifling and stagnant …. Where I or we can see different ways to do stuff, there is energy, liveliness, the possibility of newness or movement. It’s generative. Guess where I’d rather be? So much of the change work – be it with coaching clients or in organisations and systems – is about really getting into the long-held narratives and what they do for folk….genuinely understanding how a position or a story has come into being and why it is so tightly held and so defended (because more often than not, the story is defended passionately: it IS this way. You CANNOT see this situation any other way. You DON’T understand. I AM ONLY permitted to do/say/be THIS way)….and of course, there is a possibility that that is true.. and there is a possibility that it’s just one interpretation and there are other worlds out there to explore…. Perhaps this blog is mostly because I’m reading the Art of Possibility by Rosmund Stone Zander and Ben Zander Good summary here – it’s a beautiful read and is helping me see how I can contribute differently in my work…. So far, it’s the story of the Taiwanese Student that has most touched me. At the beginning of a Semester, Ben Zander (world renown conductor with the Boston Philharmonic Orchestera) is working with the best-of-the-best-students in a special programme at a Conservatoire. He wants to get them to produce the best possible performance, to get them to commit heart and soul, beyond the technical requirements of the music, their instruments, their current state. He wants them to make mistakes – and in doing so, overcome and grow – he wants them to lose their fear of errors. He makes the decision to award every student an “A” at the beginning of the semester – he tells them: Every one of you will get an A in this class. Now I need you to go and write me a letter telling me, in detail, why you have earned this A… what you do , how you feel, who you are now as this A student. This is a letter from your future self to you now… what more does that person know? What are they doing or how are they being differently from you now? How delicious….how compelling…. What a terrifyingly wonderful invitation. There is the possibility – a lifetime of an owned narrative of being number 68 good enough, turned into something else entirely by the possibility things might be better/ different for you than that and then the active choice to embrace the possibility…It’s a beautiful thing. It’s powerful as all hell. No wonder this is part of my What Matters in my work. Much of the work, when we are facilitating, is about moving people’s “states” – working to move their learning, how they see the world, their current story…. this isn’t something we talk about widely in the training of facilitators… but for me it’s a no-brainer. We move folk… or try to. So Movement is an interesting one – as humans we can be as stubborn and immovable as donkeys. We can be deeply entrenched, utterly unable or unwilling to shift our position or thinking…. And yet we are predictable, persuadable, biddable, impressionable….so somewhere in here is possibility. I’m clear, when I facilitate (and coach), that I mostly cannot move you if you are not open or able to be shifted. Your life experiences, your wiring, your world-view are there and if you choose to remain within those – if the defences are up – there is little I can do. I can learn how to persuade and influence. I can make a good case, rationally and emotionally, for a shift. I can ask good questions. I can create experiences and conversations that compel. I can create a little smoke & put you in front of mirrors (not so much my style, but it’s out there, if you pay attention) I can set the environment and the “tone” which give you the opportunities to shift. I can set something up that is as enticing and beguiling as it is possible to make a thing… and still you have to meet me someplace toward it – you need to move. I suspect when we design stuff, this shift of state is what we reach toward, consciously or otherwise. I’ll come back to this in a bit…. I’m a social scientist by training. Sociology taught me a lot about understanding social systems. We as humans pull toward being interconnected, interacting, joined-up-in-more-ways-than-we-act, social. We influence each other – someone commits an act of terror in London, there is a wider social ripple that effects us all. Someone restructures the organisation… new team and power dynamics run…. We can’t live without cause and effect – movement is inherent in all of this – changed states, shifts and patterns. Systems are, by their very nature, dynamic. They move and respond in order to survive and thrive. Bits waste and fall out of favour (atrophy) bits develop (emergence). It’s a dance of sorts. When you facilitate, in the room, it is no different. You work the system, often dancing in the moment, whether you know it or not. If you work with a group from a single Organisation, folk replicate the system the come from – they carry the rights/wrongs/ culture of the place they come from. It’s in their thinking and actions, in their behaviours and their energy – the system you work with in the room is an echo of a wider system. What is favoured one place, is a bit “meh” elsewhere. For example, if you’ll forgive the broad-brush stuff, when I’m working in Oil & Gas sector in the Middle East, I might get a repetition of engineering thinking in the room, Sector thinking (lots of emphasis on safety), the cultural mix of Northern European liberalism, Ex-pat nomads and Middle Eastern conservatism, … brought under a shared purpose of pulling oil out of the Gulf safely, which is where the cultural differences must be dropped a little. What might be valued/ permitted in this room is expertise, proven theory, certainty, formal process and action – creativity and innovation might be viewed with a little scepticism… or flat fear. In a UK Local Authority, the emphasis might be more on social thinking – systems, social care, social justice – what might be valued/ permitted in the room might be freedom to explore ideas, acknowledging complexity, collaboration, creativity and relationship-building… formal process and theory-based slide decks and definitive answers might just not work. Or when working with a group from lots of different systems, an Unconference or a cross-sector workshop, I know that individuals tend to replicate the social system they know – the norms and behaviours from their world – and group work here can be more hectic, less settled for a while, especially if norms and permissions collide….. Practical activities help you do that (be organised, understand your “flow” etc) and we will focus on physical elements which help – practices of physically centring and re-balancing. I’m drawing from Embodied Work from my teachers in this field, particularly Wendy Palmer and Amanda Ridings. Wendy looks at the physical, embodied nature of being in the world and asks how we can actively connect to our strength dignity, and warmth. In the room it is this: can you connect to the Good Stuff and extend it out, extending your personal space, creating a felt-sense of calm, inclusion etc ? Finally we’ll look in to and use Constellations – roughly speaking, this is about experiencing where we stand in relation to each other, to the sytem, to a situation or a pattern – looking at it from a number of perspectives. So we are looking at Movement – in every sense of the word – and how that fits in our practice as facilitators and what more we can do with the dynamics we work with and are influenced by. So the truth is there is a way to work collaboratively, co creatively and constructively with others. Even with people who have vastly different approaches/ preferences. And the truth is this way can’t be defined in a top-10-tip list. And collaboration needs worked at hard for the results to show. And it’s the less-easy path, because self-interest, self-protection and self-centredness is pretty easy to access. Including and involving others, trusting, sharing? Ah, now… that’s a lot more complicated. I need enough clarity, purpose & articulation to make sense. Know why I’m doing what I’m doing…and ensure folk know that. Why I think what I think & stand within that…. But not stubbornly. Not blindly or narrowly. I have to be able to give, to yield, to be as wrong as I am right. To be interested in others. I have to not be a petulant child. This is Relational Practice as I understand it. It is stuff the oils & fuels change in organisations. The stuff in between the process and procedure and formal mechanisms and rules. It’s working with ambiguity & knowing that not-knowing is transitory, but necessary. It’s not fearing new solutions. It’s not single handedly designing a 24 week organisational solution to be delivered like an Amazon Parcel. It’s building in consultation, iteration & experimentation. It’s sharing findings for bigger, more expansive outcomes, rather than tightly holding small fiefdoms. It’s uncovering answers together… because somehow going slower makes us faster. It’s pulling existing knowledge into being & building on together that so it’s better and stronger. It’s getting over yourself to the space beyond you. It’s about quiet time in the crazy. The power we think we have. The power we deny we have. The power we are clueless about. It’s about how kindly or thoughtlessly we use that power. It’s not elevating anyone either. Everyone is different, therefore we are all the same. And about humour in tough circumstances. It’s about sitting in tough & tender conversations. If we prefer the tough, it’s facing into the tender. If we prefer tender, it’s putting yourself in the tough stuff. Not denying your femininity / masculinity. Knowing you have both. I have the capacity to be assertive & strong & directive & agentic. I have the capacity to yield, to be soft & open & commune. And these are right, proper at times. And at the heart, it is about love. Love of the possible & the unknown. Love of the impossible & the known. Living with what these give & what they take. It’s about a hundred stories of hopes crushed & fights fought and getting up and cracking on anyway. It’s human spirit in all it’s heartbreaking, excruciating beauty. It’s human nature that tests things of beauty to breaking point. It’s the terrible things we do to each other to make ourselves feel better & the terrible things we do to ourselves at others’ behest. We are so clever… we are so dumb…..
And when I look at all of this…. the richness and the depth and the complexity of it all…. I think it is unsurprising that we turn from work that is relational, social, emotional – We go for simple narratives and binary decisions. and it leads us to a post-truth world, where rational data co-exists with “alternative facts” and “he-said/ She-said” is the basic narrative – a stuck one. An adversarial one. Here, there is such certainty, it undermines certainty itself. So how about we sack-off certainty and seek to collaborate, co-create and work through relationships with a little maturity and grace? Hard work as it is. Try it. Today. See what happens. Very little focuses my mind on what my point is more than having to explain my thinking publically. 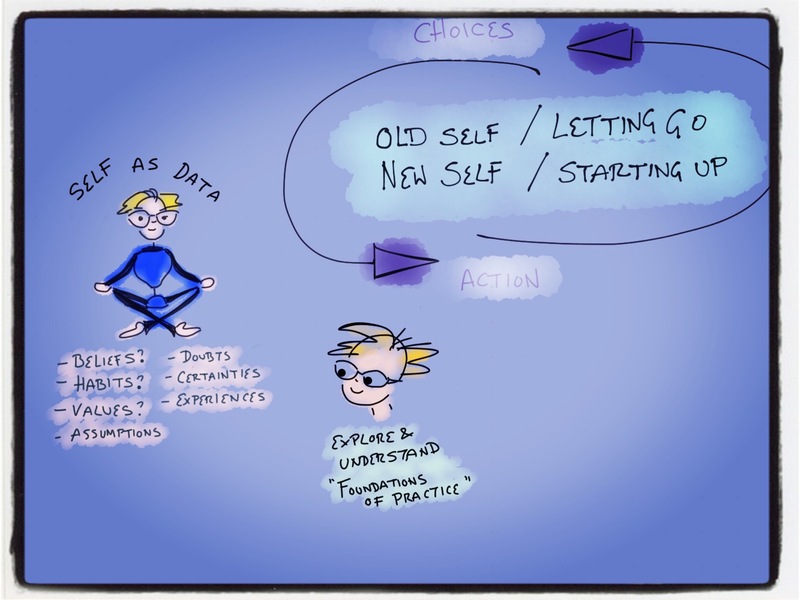 So it is that, prior to folk gathering for this month’s Facilitation Shindig, I’m mulling on WHY I believe Reflective Practice and starting with yourself-as-data is vital in any part of personal learning/growth/development. I’m a firm believer that change doesn’t happen “out there” through other folk – it happens “in here” with you and your decisions and responses…I can come back to how external forces impact and alter us, but here I’m trying to map out why I think starting with self is the key to growth and change….and then.. work out “So what?” What does that mean for your working practice? Personal growth and development requires you to start, or at least pay attention to, self-as-data. It’s essential that you have some awareness or understanding of your own “stuff” if you want to develop & change. This is because your beliefs, values, assumptions, certainties, doubts and experiences form the Foundations of your Practice – how you act and choose to be with people and situations. Understanding and exploring these means you become more deeply aware of who you are and what you can/will tolerate in life, work and in change. Through awareness, you can take informed action. So. Start with self-as-data. Pay attention to the small stuff – what you like, don’t like, what you tolerate, what is intolerable, what behaviours work for you, when you act like a git etc. Keep notes or a journal or find an app that will nudge you. Get to know yourself. From here, through self-awareness and knowing your edges, you have good information to start challenging yourself with; making choices about your behaviours that are different from your “old self” (What are the foundations you want to rattle? What do you want to let go of? What are the foundations you want to fortify? What will you keep doing? or start doing?) This is the action part. For me, reflection without action risks the territory of slightly naval-gazing/ noodling about. Action without reflection is basically begging to repeat the same behaviours and errors, without refining successes. So far, I’ve laid it all on you… trouble is we can be very skewed in our view of our own data – so alongside all this data- gathering, there is a huge role for finding others to talk to and test out theories on. Find coaches and mentors, peers, colleagues, brutal friends and semi-strangers who will help you sense-make what you find. In the event that you bump into bits of yourself that fill you with dread, shame, sadness, disgust, fear, horror etc it becomes even more important to find someone to sense-make with. This is the territory we fear to tread into and reject. Typically, this is the very territory which, if explored, gives us a bigger, freer work or life-range. Having someone – perhaps someone qualified, or just unerringly sensible and trustworthy – to share and illuminate our darker bits is..…well I just don’t know how you tackle this stuff alone. We increasingly know that change sustains and holds more when making small adjustments – small, purposeful changes are more likely to last… and yet still too often we look for outside sources (courses, mindfulness to forget about inner conflicts, how to guides etc) to enable us to make the changes – when really, it starts with you & your willingness to reach in, adjust your own dials and act. Of course, the downside is you can’t guarantee everyone around you will like it if you successfully change.. that can get interesting..… longer blog. The premise behind the Facilitation Shindig series was always to give Practitioners a year & 5 spaces to do some of this self-reflection, action-learning stuff so they really improve their Practice. Facilitation, especially when you work with teams who are unhappy or in flux, can be hugely personally challenging.. and lonely… you need a place to go to fortify yourself. And so I’ve been designing and thinking, doodling and playing with images to try to pull together some of how this stuff goes. I came up with two sketches that reach toward what I’m trying to capture. The second is a representation of that “next level” stuff that everyone goes on about – here I’m trying to show that you build on what you know and “next level” means losing or developing some of the familiar & building on new ground…. The better you know the your Foundations, the better decisions you make about what to take with & what to leave behind – means you build your “next level” on a risher, more secure platform. Not sure this drawing shows the difficulty in addressing the barriers or shows the “bounce” stuff…..
At the bottom, is looping – I’ve double looped, down into Existing Practice, up into New Practice – I like this now. It’s sort of elegantly simple, but needs a little explanation. All of this is to articulate why Practitioners benefit from taking time out to reflect, experiment, learn about themselves and try new actions and work with other people. It’s why I’ve designed the Facilitation Shindig to be a year-long programme, for those who want it to be – to give you time to become more self-aware and give yourself that time to rattle or fortify the foundations of your practice. So the basic premise is, Practitioners, that it starts with you & then it goes out to others and comes back to you. The Facilitation Shindig is a Series of events running throughout 2017 in Manchester. The aims are to upskill and support facilitators, celebrating the art and the craft of facilitation through discussion, reflection, storytelling, experimenting and action. I’m an Organisational Consultant, Exec Coach, Facilitator, Speaker, Blogger & Dialogue Guide. Working with people & organisations to improve conversations, relationships & learning – Doing stuff with love. I got tagged in Sam Roger’s tweet (see pic above) by Marco Faccini the other day and it made me grin – because sometimes, despite my oodly-moodly tendencies to reflect and pause, for me, change work really is all about doing The Thing. Taking action or avidly holding to inaction – working with and against grains. Doing what it takes to get things moving, shifting, starting, stopping… doing The Thing. Not thinking about it. Not going on stage and talking about it. Not finding a perfect definition of it. Doing it. I know others whose The Thing is way bigger than this – provocative, challenging, bold colourful- and I like to peek over those fences, sometimes perturbed, sometimes breathless at the audacity, sometimes scathing of the certainty and showmanship… and I’m frequently impressed by the impact they have…and I never really learn what happens beyond that impact….and I’m curious about how the Big Thing leads to action and application. I know others whose The Thing is quieter, less bold, less provocative, thoughtful, differently beautiful, more contained, not showy or world-wide, but nevertheless potent. It is often here I see the work happening – the action, the gatherings, the challenge to the norms, the collective practice, the agreement and disagreements, the subversion and the revision….. So I’m curious….what’s your Thing? If you were to Just Do The Thing… what would yours be? Your contribution? Your action? Your most useful part in making things change? After the Laundry, The Ecstacy?